This item requires shipping quote due to weight. The Ultimate Hurt is a superior trauma and extrication manikin with three interchangeable heads: standard and trauma intubation heads and Mr. Hurt Head. 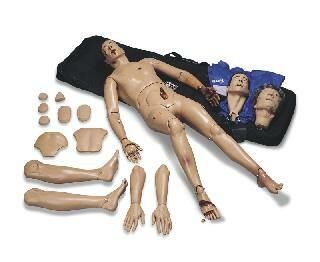 He comes with a wide range of trauma wound modules to enhance scenarios. Ultimate Hurt includes: Manikin, Heads (3), Wound Set, Manikin Lubricant, Jacket, Pants, Carry Case and Directions for Use.